Drivers looking for a confident and well-equipped midsize sedan with a unique attitude have long been fans of the VW Passat. For the 2019 model year this model will come with a streamlined trim lineup and updated safety features. With a starting Manufacturer’s Suggested Retail Price of $25,295 plus a $895 destination fee, the 2019 Volkswagen Passat near Mobile AL offers plenty of punch. All models of the 2019 Volkswagen Passat will come with a 2.0-liter four-cylinder engine mated to a six-speed automatic transmission and rated for 174 horsepower and 184 pound-feet of torque. This powertrain should offer up to 25 mpg in city driving and 36 mpg on the highway. Drivers will be able to enjoy a bold base Wolfsburg Edition trim or the elite SE R-Line® model. 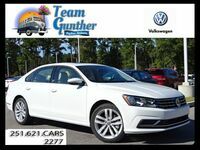 All models of the 2019 VW Passat at Team Gunther VW in Daphne AL will also come with the elite Volkswagen People First Warranty. The 2019 Volkswagen Passat near Mobile AL may have a limited number of trims for the new model year, but each one delivers premium features. Newly standard safety features on this midsize sedan include the Automatic Post-Collision Braking System, the Volkswagen Intelligent Crash Response System, Forward Collision Warning, Autonomous Emergency Braking with Pedestrian Monitoring and Blind Spot Monitor Rear Traffic Alert. Adaptive Cruise Control and the Lane Keeping System are standard on SE R-Line® models while Park Distance Control is available on this upper trim. The base Wolfsburg Edition trim will offer 17-inch wheels, a 6.3-inch touchscreen infotainment system, the Volkswagen Car-Net® App-Connect system (which enables both Apple CarPlay and Android Auto connectivity), SiriusXM® radio, Voice Controls, leatherette seating, heated front seats and side mirrors and KESSY® keyless access with push-button start. Drivers can even enjoy larger wheels and a sunroof with an available package. Going for the elite SE R-Line® model offers drivers both luxury options and sporty good looks. Extensive LED lighting, built-in navigation, an Easy Open trunk, and a Fender® Premium Audio system are some feature highlights. Would you like to learn more about the 2019 Volkswagen Passat coming to our dealership in Daphne AL near Mobile AL? 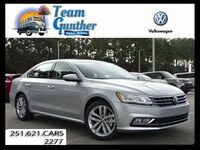 Contact a representative at Team Gunther Volkswagen today.